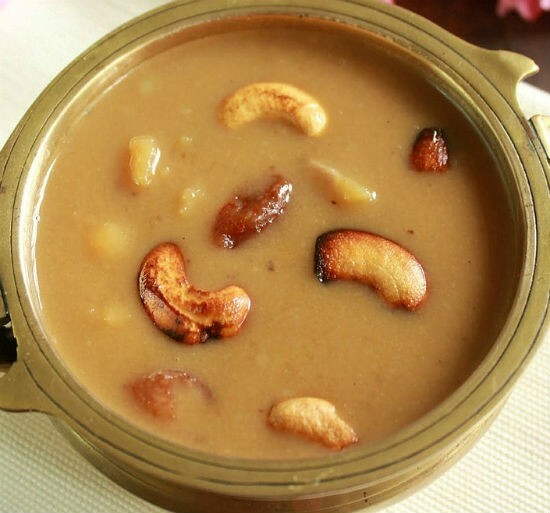 Ada Pradhaman is a popular Kerala sweet made during Onam and served at the end of the Onam Sadya. 1. Soak the rice for 30 to 60 minutes. 2. Drain well and spread it to dry on a white cloth for an hour or two. 3. Once all moisture has gone, grind to a fine powder and sieve well. 4. Heat 1 tsp of ghee and add to the powder. 5. Add 1 tsp of sugar and enough warm water. 6. Mix well to a chapati dough consistency. 7. Cut the plantain leaves into small-medium squares. 8. Hold them over low flame to make them flexible. 9. Heat a large pan of water and bring to a boil. 10. Make small balls of the dough and place them on the plaintain leaves. 11. Spread them using the back of a spoon or your palm. 12. Drop this into the boiling water. 13. Once cooked, the ada will start to float. 14. Alternatively you can steam cook the ada. Remove, strain and scrape out the adas . Wash them in plenty of water to remove the stickiness and chop them finely. 15. Grate the coconut and extract 1 cup of thin milk (second milk) and 1 cup of thick milk (first milk). 16. Heat ghee in a pan over medium flame. 16. Add the cooked ada and fry well. 17. Add the thin milk, jaggery and sugar. 18. Simmer for 5 to 10 minutes. 19. Now add the thick milk and simmer for another 5 minutes, stirring thoroughly. 20. Add cardamom powder and mix well. 21. Fry the cashew nuts and raisins in little ghee and add to the pan. Tip: You can also buy readymade ada (also called as Palada) and use. 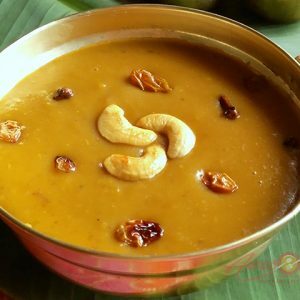 Feel free to comment or share your thoughts on this Ada Pradhaman Recipe from Awesome Cuisine.